It is common for a storm or car crash to cause overhead powerlines to be downed. Although electrical injuries are not common, the dangers of downed powerlines should not be underestimated. Downed powerlines can carry an electrical current strong enough to cause serious injury or death. The stronger the electrical current charging throughout a person’s body, the more serious their injuries will be. Electrical injuries range from a slight tingling sensation to respiratory paralysis and cardiac arrest caused by ventricular fibrillation. Deep tissue burning is likely to occur wherever the current flows throughout the body. Much of the burning may be internal and not immediately apparent to first responders. Internal burning can be deadly and cause serious injuries to internal organs. The most severe injuries occur when the electrical current passes through the person’s heart and lungs. Electrical injuries occur when you comes into contact with an electrical source, such as a downed powerline. The electrical current is transferred from the powerline to your body. One way you can come into contact with an electrical source is by directly touching a downed powerline. You may also suffer electrical injuries, if you touch anything in contact with the fallen powerline, such as a fence or car. If a downed powerline has fallen on your car, you should stay inside your vehicle, if possible, and wait for rescue crews to arrive. However, you do not need to touch a downed powerline in order to suffer an electrical injury. It is important to know that you can suffer an electrical injury from simply stepping on the ground that is near a downed powerline. The ground near a fallen powerline could be energized up to 35 feet away from the powerline. You will not be able to tell whether the ground is energized or not by simply looking at it. It is vital to assume that all powerlines are energized and you should not approach the area. Drivers should avoid driving over a fallen powerline. It should be confirmed that the source of the electricity is turned off before anyone approaches the scene of the downed powerline. If you find yourself in the vicinity of a downed powerline, you should keep both your feet together and shuffle away without picking up your feet. You should immediately call 9-1-1 or your local utility company if you see if a downed powerline. In the event that you or a loved one has suffered an electrical injury from a downed powerline, it is important that you understand your legal rights. 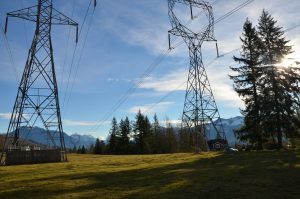 The electrical injury could be the result of another’s negligence and there are many individuals or entities that could be held responsible, including the public utility company or the first responders. The experienced personal injury lawyers at Kraft Davies are available to consult with you regarding your entitlement to damages or compensation. Please call us at (206) 624-8844 or contact us through this website.